1- Hose discharges may not be subjected to pressure when the flow-meter is put into operation. 2- Medium-supply lines must be thoroughly cleaned before use. 3- Use of a 20 μm (Micron) pre-filter is recommended. 4- Slid particles or contamination in the medium may damage the flow-meter and/or influence the measurement results. 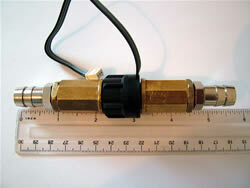 5- IMPORTANT: WATCH ARROW ON FLOW-METER TO INSTALL IT IN CORRECT FLOW DIRECTION. 6- Once the flow-meter has been installed, the system should be filled slowly, to avoid air damaging the rotor. 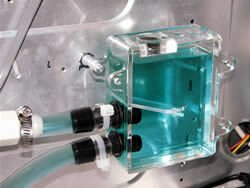 7- Hook up electronic connector to the flow-meter. Make sure that the electrical connections have been hooked up as indicated on this diagram. 8- Make sure electronic connector is not coming into contact with liquids. This may influence measuring results negatively. 9- Remember to remain within the minimum and maximum flow-rate limits as indicated. Avoid any UNCONTROLLED AIR PRESSURE through the flow-meter. High bars at the beginning which results in more than 38.000 rotations per second of the rotor will DESTROY rotor blades. 10- The measurement principle is based on volume measurement; air in water, for example, counts as a medium. Once the flow-meter has been installed in accordance with these directions, a smooth operation is guaranteed.